The conference theme at ECER 2017 in Copenhagen was "Reforming Education and the Imperative of Constant Change: Ambivalent roles of policy and educational research". InFo-TED: Ainat Guberman, Marit Ulvik, Mieke Lunenberg and Jean Murray. Three years ago, at the ECER Conference in Porto, we organized a roundtable to debate our plans for an International Forum for Teacher Educator Development (InFo-TED). As well as national presentations, the session included a lively debate which identified many of the issues in professional development of teacher educators across Europe. 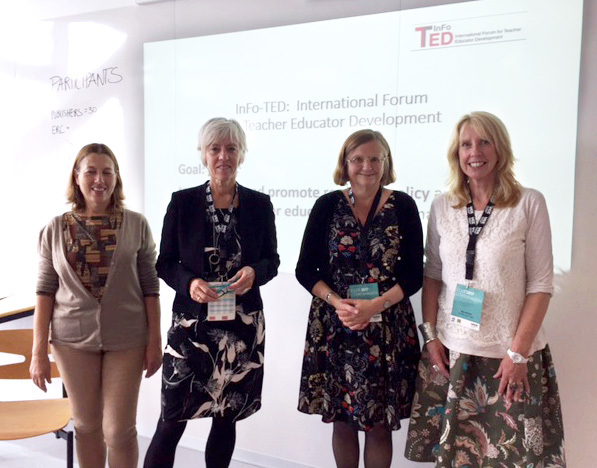 Since then, as also reported on several conferences, among them ECER 2015 and ECER 2016, InFo-TED has travelled on, developed a conceptual model (Conway at al., 2015), and carried out an extensive international survey study on teacher educators (Czerniawski, Guberman, & MacPhail, 2016). Central to our InFo-TED work is to recognize the tensions between national voices and a shared European ideal. We represent different countries, each with their own teacher education systems and cultures, but we also have a shared goal (Lunenberg et al., 2016). Recently InFo-TED received funding from the European Commission to develop a learning platform for teacher educators and to also organize regional meetings and an international summer school for teacher educators. The outcomes of the international survey and of a follow-up interview study on the survey (see below) will provide a solid base for these activities. This roundtable discussion will bring together teacher educators from England, the Netherlands, Norway, and Israel, all members of the InFo-TED council. It seeks to follow up the debates in Porto, recognizing the continuous changes in European policy and practice (Murray 2012; Berry 2013). Starting from their national settings as well as building on InFo-TED’s international research studies, the presenters will initiate a debate about how in future years, InFo-TED may be able to contribute innovative initiatives to facilitate the professional development of teacher educators around Europe. In 2013, the European Commission emphasized that in order “to strengthen the professional awareness and identity of teacher educators, it is necessary to identify and acknowledge the areas of competence (knowledge, skills and attitudes) that underpin teacher educators’ diverse, multifaceted roles” (2013, p.39). InFo-TED recognized this need and conducted an international comparative survey (n= 1158) on teacher educators in 2015. The questions in this international survey-study were theoretically grounded in earlier national studies on the ‘researcherly dispositions’ of teacher educators (Tack & Vanderlinde, 2016), the professional learning needs of teacher educators (Dengerink, Kools, & Lunenberg, 2015; Smith 2011) and the identities of the group (Murray, 2012). The outcomes of the study showed, among other things, interesting differences among teacher educators in the participating countries with regard to educational and research orientations and wishes with regard to professional development (Czerniawski, Guberman, & MacPhail, 2016). National policies and practical considerations seem to shape teacher educators’ attitudes. As a follow-up on this survey and to get more insights in the underlying national circumstances and assumptions of teacher educators, InFo-TED is now conducting interviews with a representative selection of teacher educators in the seven participating countries. The outcomes of this study will be presented at this round table. Representatives from England, Norway, Israel, Ireland and the Netherlands will sketch the national policy developments since 2013 (Brexit in the UK as most striking example) and its influences on the practices and values of teacher educators in their countries (4 x 10 minutes). The floor will then be opened to discussion around a few key questions which we will set for our audience. Berry, M. 2013. Teacher Educators’ Professional Learning: “You’re more or less on your own”. Paper Presented at ISATT, Ghent, 2-7th July 2013). European Commission (2013). Supporting Teacher Educators for better learning outcomes. Brussel: EC. Murray, J. 2012. Towards the re-articulation of the work of teacher educators in Higher Education institutions in England. European Journal of Teacher Education 31. 1. pp. 17–34. Vanassche, E., Rust, F., Conway, P. F., Smith, K., Tack, H., & Vanderlinde, R. (2015). InFo-TED: Bringing policy, research, and practice together around teacher educator development. In: C. Craig and L. Orland-Barak (eds.) International teacher education: promising pedagogies (Part C) (Advances in research on teaching, Volume 22C, pp. 341 - 364). Bingley, UK: Emerald.